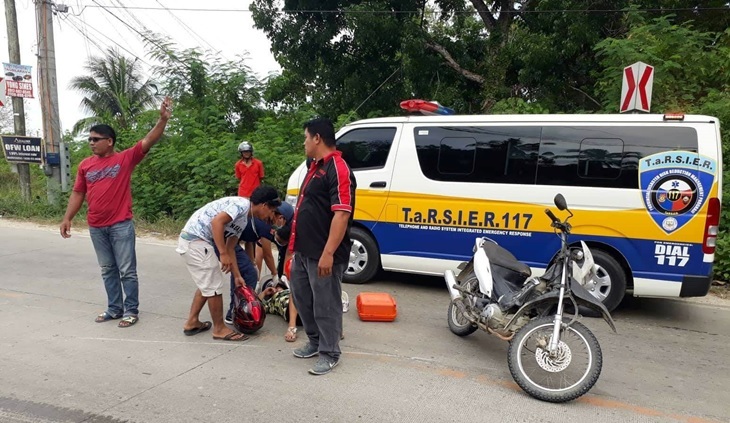 A man and his pregnant wife were injured after their motorcycle crashed in Barangay Dampas in Tagbilaran City at past 3 p.m. on Tuesday. According to witnesses, the victims were traveling along the Mansasa-Dampas road and heading towards the Dao Terminal when their motorcycle suddenly swerved repeatedly and crashed. The motorcycle driver reportedly lost control of his vehicle when the car in front of him made an abrupt stop. Both victims, who have yet to be identified by the authorities, suffered minor cuts while the pregnant woman said that she experienced stomach pain. It also took a while for her to recover and stand. Meanwhile, responding personnel of TaRSIER 117 brought the pregnant woman to a hospital for precautionary examination. Based on statements from passersby in the area, the victims’ motorcycle was speeding prior to the accident.